The folk art of Gorenjska Region is showcased by artistically and exceptionally well crafted items for everyday use, which are based on their primary function in everyday life, arranged into four chapters, namely folk architecture of the Gorenjska region, the interior furniture of the apartments, the festive and work areas of a typical Gorenjska person and his spiritual culture. 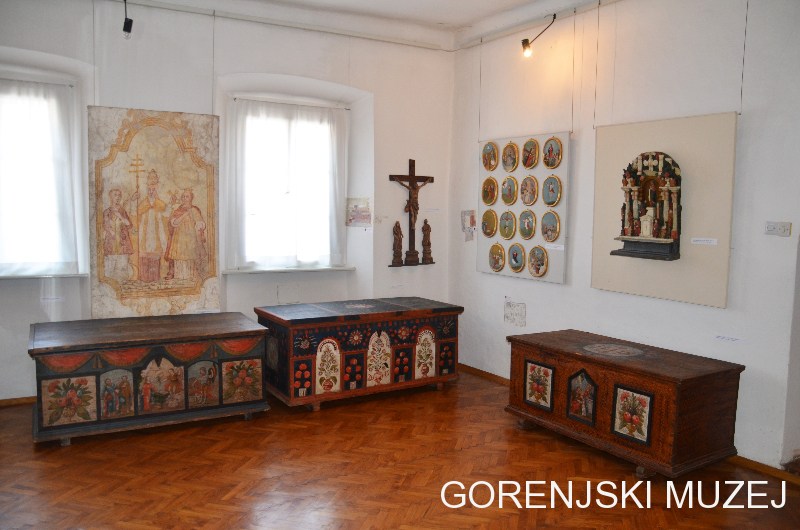 The folk art of the Gorenjska region grew and developed from the roots of family traditions and from examples coming to the rural area from more advanced segments of society. The influence of the neighbouring territories, which the Gorenjska person incorporated into his own culture, connect us to the broader circle of Eastern Alpine lands. 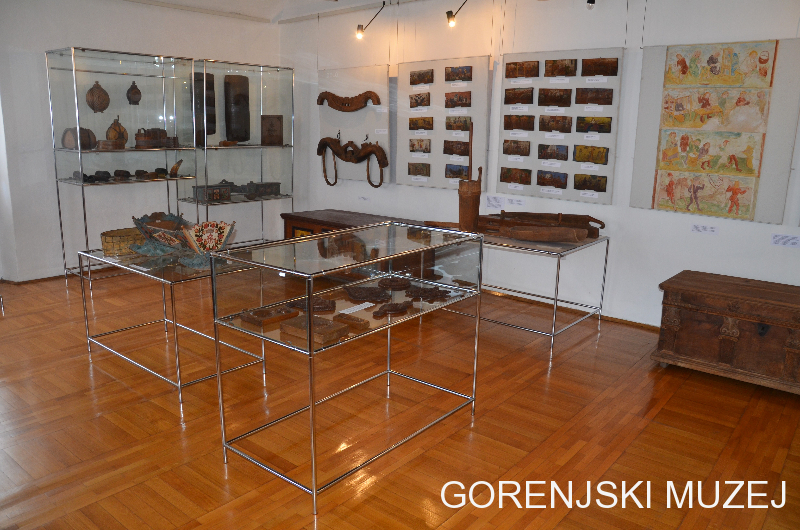 The introductory part of the exhibition points to the role of the settlements and architecture in the creation of the Gorenjska regional culture. Thus, hay drying stacks, larders, shepherd’s huts, the characteristically shaped farmsteads and village marks are all housed here. 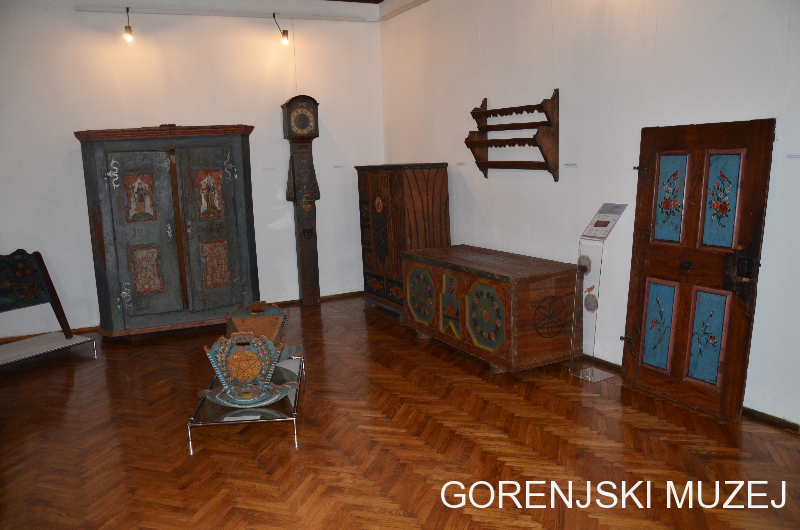 The original architectural artefacts, which are built into the exhibition space show the traditional design of a Gorenjska farmstead, which, for a long time, echoed the influences of the gothic and later the baroque period, for example, the baroque wooden ceiling, the carved portal, painted doors and hall-windows, carved boards of the traditional Gorenjska “gank”, the wall fresco and iron-forged window grating. 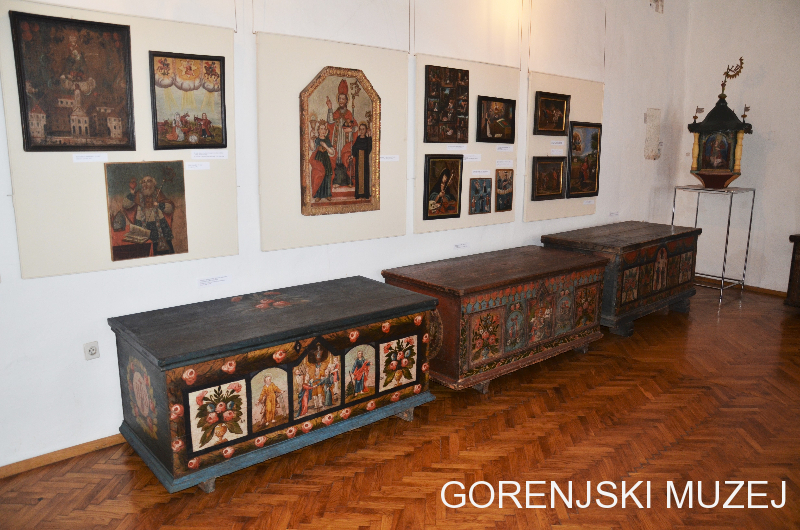 Apart from the farmstead, this exhibition space also shows the development of making the typical Gorenjska chest, from the oldest made in 1642 to the latest from the first half of the 19th Century. In the adjacent space we can see the chests made by different territorial workshops which produced and decorated these chests and cradles. 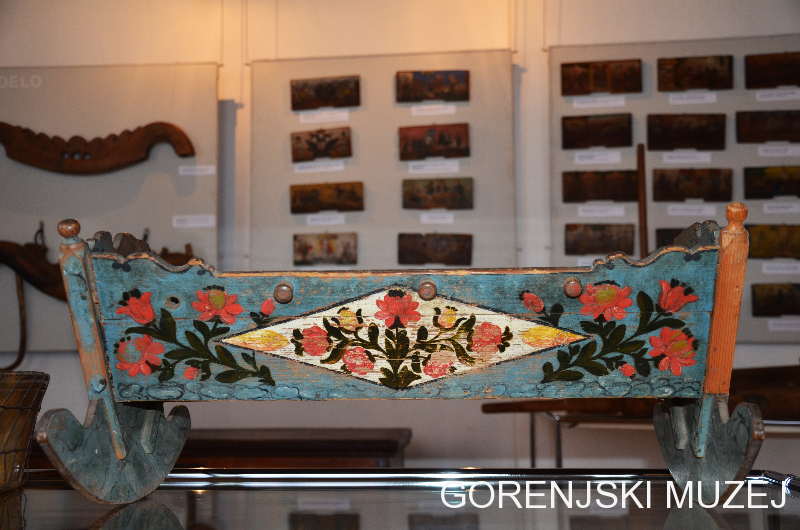 In the Upper Sava valley they also decorated other pieces of furniture. The most notable element of the interior design of the farmsteads is painted furniture. The tradition of artistically decorated furniture dates back to the early 17th Century and peaked in the social-economic changes of the late 18th Century and the first two thirds of the 19th Century. 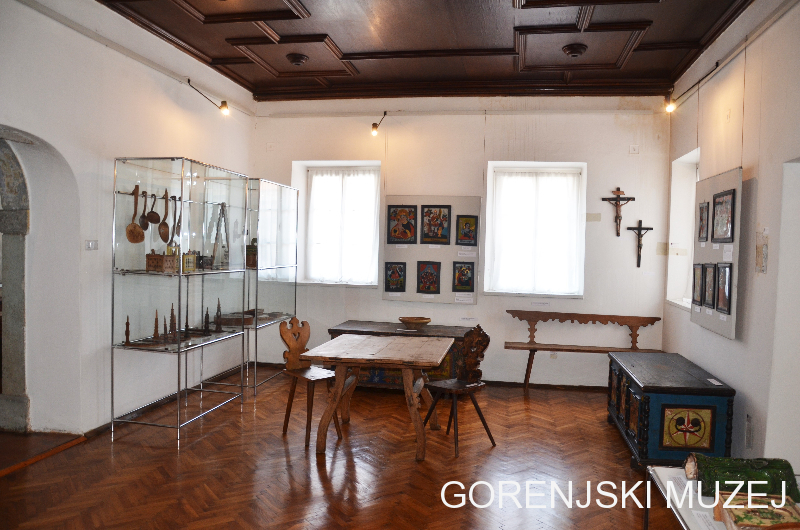 Most of the artefacts are from the Upper Sava region, where the tradition of folk painting was especially intense and was kept alive until as late as the 1930s. 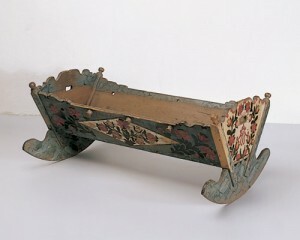 The chest was primarily used to transport the bride’s dowry, a tradition that continued into the middle of the 20th Century. This is why chests were decorated everywhere in the Gorenjska region. 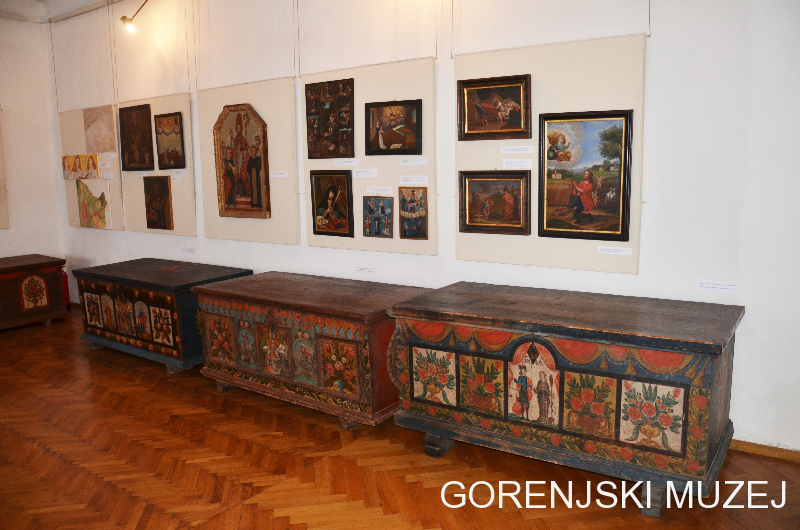 A wardrobe from the baroque period painted in the style of the Upper Jezersko region is also on display, while the influence of the urban style of furniture decoration can be seen in the table made in 1774 in Bohinj. 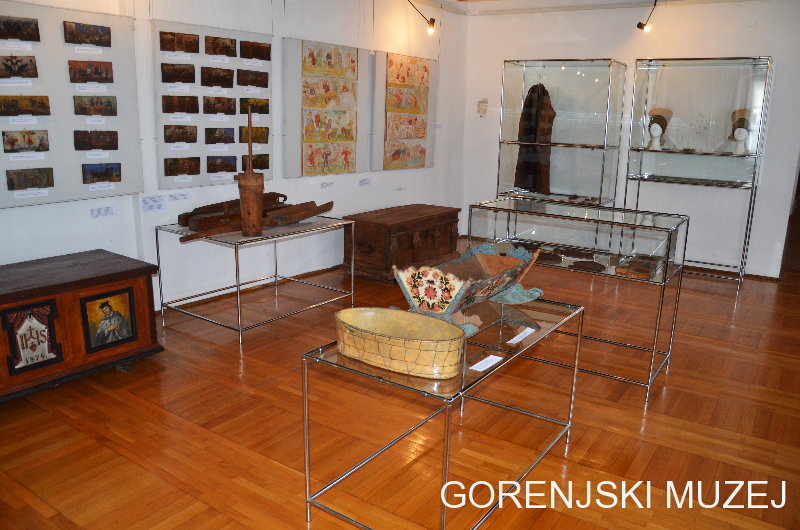 The creativity of Gorenjska natives came through in various different ways, such as making of smaller useful items out of wood, iron and clay. By shape and simple colour paintings we can recognise the clay products of the two old country pottery centres in Ljubno and Komenda. Distaffs (the sticks onto which wool or flax is wound for spinning) were also creatively adorned and carved, as boys traditionally gave them to girls as a sign of affection (and were used as holding utensils). Similarly, the carved spoon holders, wooden spoons, butter dishes and bowls reflect the 19th and early 20th century taste of the rural population. 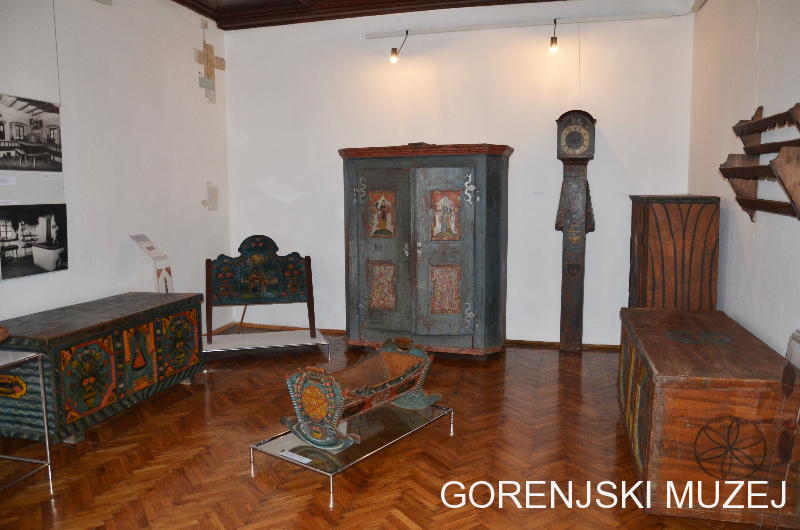 Festive decorations used during the holidays by the Gorenjska people are also exhibited: the decorative elements of the traditional dress of men and women, festive embroidery, a christening cradle and festive figurines made of honey-dough along with the models for making them. The copy of the fresco Holy Sunday from the 15th century church in Crngrob, which shows the tasks that are forbidden on Sundays leads to the part of the exhibition showing the artefacts of the working areas of the Gorenjska people. Here we can see various wooden dishes, tools and other working utensils, carved horn sheaths and children’s toys. The painted beehive decorative plates are peculiar to Slovenia and are linked to the great economic importance of honey production in our past. A separate area is dedicated to the presentation of folk art in rural churches, village marks and the more religious artefacts from homesteads of the people, such as the baroque frescos from facades of wealthy farmsteads and the wooden religious plastic art. Among the exhibited, there are also chests with especially rich religious figural motives, created in the painting studios of Leopold Layer (1725-1828) and his students, which catered to the church and farm customers. The echoes of this studio reached the first half of the 19th Century in the broader Kranj region.